The Brunettes are an Indie pop or twee pop group from New Zealand formed in 1998. The band are signed to Auckland based label Lil' Chief Records. The Brunettes' first album Holding Hands, Feeding Ducks released in 2002 was the debut release for the label. This was followed 6 months later by the mini-album The Boyracer EP. In the U.S. their recordings appear on the Sub Pop label. "Brunettes Against Bubblegum Youth" is currently featured on an extended advertisement for Hollyoaks, on Channel 4 (and E4) in the UK. Justin Martin is an acoustic singer songwriter based in Aberdeen. Previous support slots include Amber, The Haze, Lunarmile, Belgium rockers Enemy Rose, Jeep Solid and alot more. He has also played a set on Aberdeen Student Radio. 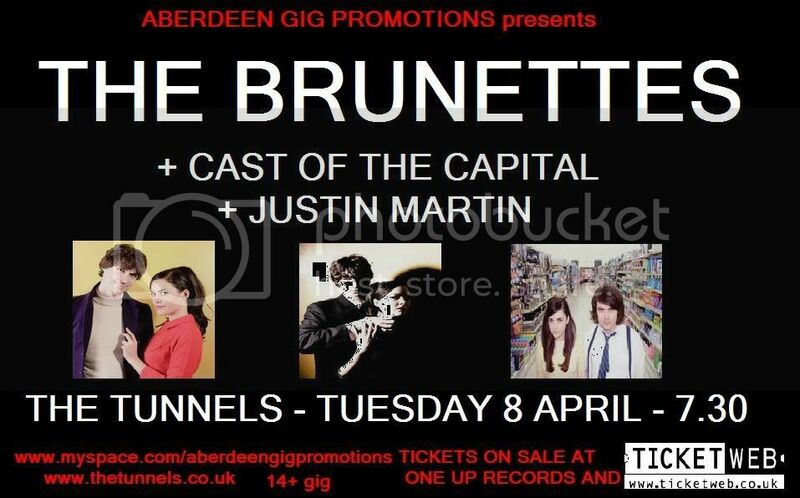 I caught the Brunettes in Belfast a few months ago (on my first date wuth my special lady) and they were excellent. They just draw you in and wrap you up in their music. Good Night! The Brunettes were amazing!